The bandwidth of a telecom fiber is understood to be the maximum bandwidth of signals which can be transmitted through the fiber without obtaining strong signal degradations. In case of multimode fibers, that bandwidth is usually limited by intermodal dispersion. In such cases, it is called the modal bandwidth. As that bandwidth is often inversely proportional to the used length of fiber, it is common to specifies the bandwidth–distance product. Note, however, that the modal properties of the fiber can in principle change along the length, so that the modal bandwidth may not be inversely proportional to the fiber length. 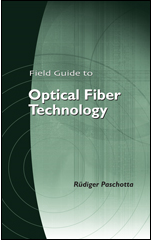 A traditional method is the overfill launch method (OFL method), where one tries to spread the input light relatively smoothly over all guided modes of the fiber. Such launch conditions, however, are usually not representative for systems using VCSELs; therefore, the resulting “overfilled modal bandwidth” is not a good measure for the actual performance to be expected from a VCSEL-based system. The “DMD mask” method compares DMD test results against a set of specifications (called templates or masks) for determining whether or not the modal dispersion is weak enough for given transmission conditions. Another approach is to define a calculated minimum effective modal bandwidth (EMBc) as a kind of worst-case result for a defined set of operation conditions. There have been arguments between fiber manufacturers about what kind of detailed specification is most practical and reliable for estimating or guaranteeing the performance of fiber-optic links. Such arguments are often brought forward with somewhat unclear technical details, apparently trying to gain advantages for the marketing from the created impression concerning the reliability of different transmission fibers.